This week at Kew Gardens we wasted no time in making our way to the treetop walkway. Our children were interested in the different signs for the trees and looked at the multi-coloured leaves scattered on the ground along the way. We counted the steps all the way up and all the way down too! We picked leaves to draw faces on and even picked the leaves that were the same size as our faces. We had some rain this week so our children came up with games to play in them. Some children used the puddles as a river that they had to avoid so that they wouldn’t ‘drown’. 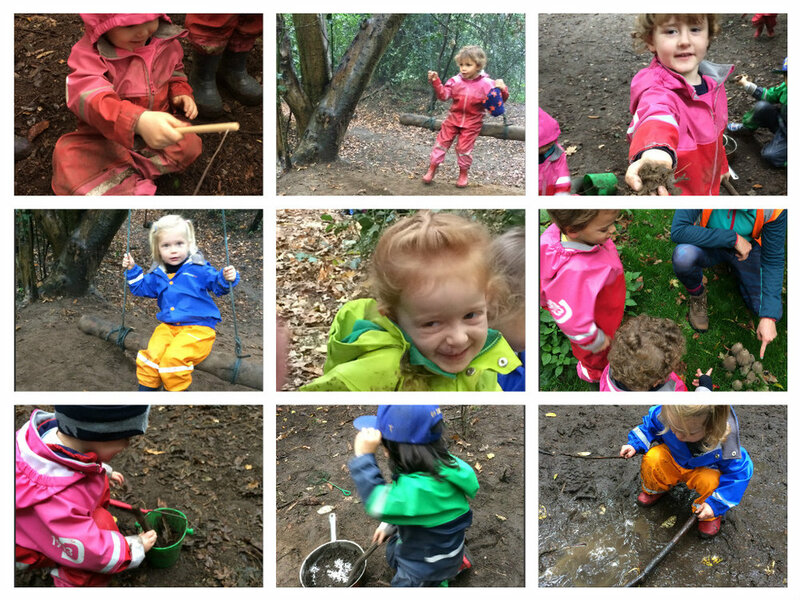 Others obviously splashed until they were absolutely covered in mud and called themselves ‘mud monsters’. We had children digging holes in the ground to use as their kitchen. They said that the holes were used for baking cakes in. Our children love using ropes and pretending that they’re different things. Some of the popular things are trains, snakes and lassos. They imagined the rope was a snake that was trying to eat their delicious chocolate cupcakes.